Chanteur US né le 22 Janvier 1931 à Clarksdale (Mississippi). Sam Cooke débute en 1950, alors qu'il est chanteur d'un groupe de Gospel: les Soul Stirrers, qu'il quittera en 1956. Sam enregistre ensuite sous le nom de Dale Cook puis retrouve son nom pour son premier album. A partir de 1960, il devient un habitué des charts sur RCA. Sam Cooke fut l'un des premiers artistes noirs à posséder un label. Il a été assassiné en petite tenue dans un motel de Los Angeles (Californie), le 11 Décembre 1964. Sam Cooke was the most important soul singer in history -- he was also the inventor of soul music, and its most popular and beloved performer in both the black and white communities. Equally important, he was among the first modern black performers and composers to attend to the business side of the music business, and founded both a record label and a publishing company as an extension of his careers as a singer and composer. Yet, those business interests didn't prevent him from being engaged in topical issues, including the struggle over civil rights, the pitch and intensity of which followed an arc that paralleled Cooke's emergence as a star -- his own career bridged gaps between black and white audiences that few had tried to surmount, much less succeeded at doing, and also between generations; where Chuck Berry or Little Richard brought black and white teenagers together, James Brown sold records to white teenagers and black listeners of all ages, and Muddy Waters got young white folkies and older black transplants from the South onto the same page, Cooke appealed to all of the above, and the parents of those white teenagers as well -- yet he never lost his credibility with his core black audience. In a sense, his appeal anticipated that of the Beatles, in breadth and depth. He was born Sam Cook in Clarksdale, MS, on January 22, 1931, one of eight children of a Baptist minister and his wife. Even as a young boy, he showed an extraordinary voice and frequently sang in the choir in his father's church. During the middle of the decade, the Cook family moved to Chicago's South Side, where the Reverend Charles Cook quickly established himself as a major figure in the religious community. Sam and three of his siblings also formed a group of their own, the Singing Children, in the 1930s. Although his own singing was confined to gospel music, he was aware and appreciative of the popular music of the period, particularly the melodious, harmony-based sounds of the Ink Spots, whose influence could later be heard in songs such as "You Send Me" and "For Sentimental Reasons." As a teenager, he was a member of the Teen Highway QCs, a gospel group that performed in churches and at religious gatherings. 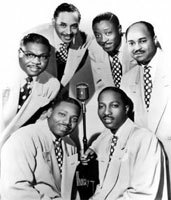 His membership in that group led to his introduction to the Soul Stirrers, one of the top gospel groups in the country, and in 1950 he joined them. If Cooke had never recorded a note of music on his own, he would still be remembered today in gospel circles for his work with the Soul Stirrers. Over the next six years, his role within the group and his prominence within the black community rose to the point where he was already a star, with his own fiercely admiring and devoted audience, through his performances on songs like "Touch the Hem of His Garment," "Nearer to Thee," and "That's Heaven to Me." The group was one of the top acts on Art Rupe's Specialty Records label, and he might have gone on for years as their most popular singer, but Cooke's goal was to reach audiences beyond the religious community, and beyond the black population, with his voice. This was a tall order at the time, as the mere act of recording a popular song could alienate the gospel listenership in an instant; singing for God was regarded in those circles as a gift and a responsibility, and popular music, rock & roll, and R&B were to be abhorred, at least coming from the mouth of a gospel singer; the gap was so great that when a blues singer such as Blind Gary Davis became "sanctified" (that is, found religion) as the Rev. Gary Davis, he could still sing and play his old blues melodies, but had to devise new words, and he never sang the blues words again. He tested the waters of popular music in 1956 with the single "Lovable," produced by Bumps Blackwell and credited under the name Dale Cooke so as not to attract too much attention from his existing audience. 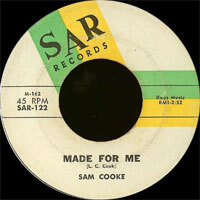 It was enough, however, to get Cooke dropped by the Soul Stirrers and their record label, but that freed him to record under his real name. The result was one of the biggest selling singles of the 1950s, a Cooke original entitled "You Send Me," which sold over two million copies on the tiny Keen Records label and hit number one on both the pop and R&B charts. Although it seems like a tame record today, "You Send Me" was a pioneering soul record in its time, melding elements of R&B, gospel, and pop into a sound that was new and still coalescing at the time. 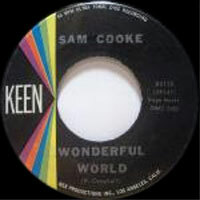 Cooke was with Keen for the next two years, a period in which he delivered up some of the prettiest romantic ballads and teen pop singles of the era, including "For Sentimental Reasons," "Everybody Loves to Cha Cha Cha," "Only Sixteen," and "(What A) Wonderful World." These were extraordinarily beautiful records, and in between the singles came some early album efforts, most notably Tribute to the Lady, his album of songs associated with Billie Holiday. 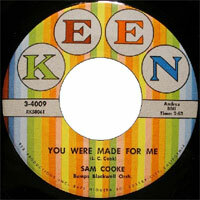 He was unhappy, however, with both the business arrangement that he had with Keen and the limitations inherent with recording for a small label -- equally to the point, major labels were knocking on Cooke's door, including Atlantic and RCA Records; Atlantic, which was not yet the international conglomerate that it later became, was the top R&B-oriented label in the country and Cooke almost certainly would have signed there and found a happy home with the company, except that they wanted his publishing, and Cooke had seen the sales figures on his songs, as well as their popularity in cover versions by other artists, and was well aware of the importance of owning his copyrights. Thus, he signed with RCA Records, then one of the three biggest labels in the world (the others being Columbia and Decca), even as he organized his own publishing company, Kags Music, and a record label, SAR, through which he would produce other artists' records -- among those signed to SAR were the Soul Stirrers, Bobby Womack (late of the Valentinos, who were also signed to the label), former Soul Stirrers member Johnny Taylor, Billy Preston, Johnnie Morisette, and the Simms Twins. 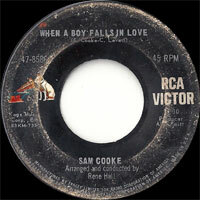 Cooke's RCA sides were a strangely schizophrenic body of work, at least for the first two years. 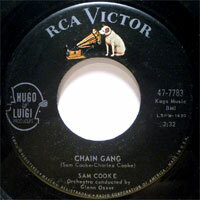 He broke new ground in pop and soul with the single "Chain Gang," a strange mix of sweet melodies and gritty, sweaty sensibilities that also introduced something of a social conscience to his work -- a number two hit on both the pop and R&B charts, it was his biggest hit since "You Send Me" and heralded a bolder phase in his career. Singles like bluesy, romantic "Sad Mood," the idyllic romantic soul of "Cupid," and the straight-ahead dance tune "Twistin' the Night Away" (a pop Top Ten and a number one R&B hit), and "Bring It on Home to Me" all lived up to this promise, and also sold in huge numbers. But the first two albums that RCA had him do, Hits of the Fifties and Cooke's Tour, were among the lamest LPs ever recorded by any soul or R&B singer, comprised of washed-out pop tunes in arrangements that showed almost none of Cooke's gifts to their advantage. 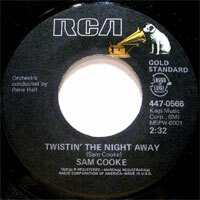 In 1962, Cooke issued Twistin' the Night Away, a somewhat belated "twist" album that became one of his biggest-selling LPs. He didn't really hit his stride as an LP artist, however, until 1963 with the release of Night Beat, a beautifully self-contained, dark, moody assembly of blues-oriented songs that were among the best and most challenging numbers that Cooke had recorded up to that time. By the time of its release, he was mostly identified through his singles, which were among the best work of their era, and had developed two separate audiences, among white teen and post-teen listeners and black audiences of all ages. It was Cooke's hope to cross over to the white audience more thoroughly, and open up doors for black performers that, up to that time, had mostly been closed -- he had tried playing the Copa in New York as early as 1957 and failed at the time, mostly owing to his inexperience, but in 1964 he returned to the club in triumph, an event that also yielded one of the most finely recorded live performances of its period. 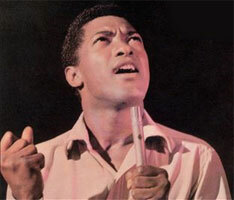 The problem with the Copa performance was that it didn't really represent what Sam Cooke was about in full -- it was Cooke at his most genial and non-confrontational, doing his safest repertory for a largely middle-aged, middle-class white audience; they responded enthusiastically, to be sure, but only to Cooke's tamest persona. 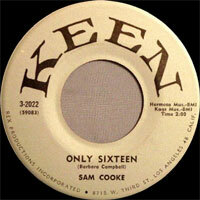 In mid-1963, however, Cooke had done a show at the Harlem Square Club in Miami that had been recorded. Working in front of a black audience and doing his "real" show, he delivered a sweaty, spellbinding performance built on the same elements found in his singles and his best album tracks, combining achingly beautiful melodies and gritty soul sensibilities. 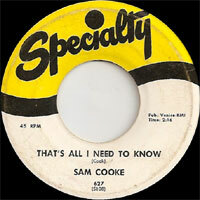 The two live albums sum up the split in Cooke's career and the sheer range of his talent, the rewards of which he'd finally begun to realize more fully in 1963 and 1964. The drowning death of his infant son in mid-1963 had made it impossible for Cooke to work in the studio until the end of that year. During that time, however, with Allen Klein now managing his business affairs, Cooke did achieve the financial and creative independence that he'd wanted, including more money than any black performer had ever been advanced before, and the eventual ownership of his recordings beginning in November of 1963 -- he had achieved creative control of his recordings as well, and seemed poised for a breakthrough. It came when he resumed making records, amid the musical ferment of the early '60s. Cooke was keenly aware of the music around him, and was particularly entranced by Bob Dylan's song "Blowin' in the Wind," its treatment of the plight of black Americans and other politically oppressed minorities, and its success in the hands of Peter, Paul & Mary -- all of these factors convinced him that the time was right for songs that dealt with more than twisting the night away. The result was "A Change Is Gonna Come," perhaps the greatest song to come out of the civil rights struggle, and one that seemed to close and seal the gap between the two directions of Cooke's career, from gospel to pop. Arguably his greatest and his most important song, it was an artistic apotheosis for Cooke. During this same period, he had also devised a newer, more advanced dance-oriented soul sound in the form of the song "Shake." These two recordings heralded a new era for Cooke and a new phase of his career, with seemingly the whole world open to him. None of it was to be. Early in the day on December 11, 1964, while in Los Angeles, Cooke became involved in an altercation at a seedy motel, with a woman guest and the night manager, and was shot to death while allegedly trying to attack the manager. The case is still shrouded in doubt and mystery, and was never investigated the way the murder of a star of his stature would be today. Cooke's death shocked the black community and reverberated far beyond -- his single "Shake" was a posthumous Top Ten hit, as were "A Change Is Gonna Come" and the At the Copa album, released in 1965. Otis Redding, Al Green, and Solomon Burke, among others, picked up key parts of Cooke's repertory, as did white performers, including the Animals and the Rolling Stones. Even the Supremes recorded a memorial album of his songs, which is now one of the most sought-after of their original recordings, in either LP or CD form. His reputation survived, at least among those who were smart enough to look behind the songs -- to hear Redding's performance of "Shake" at the Monterey Pop Festival, for example, and see where it came from. 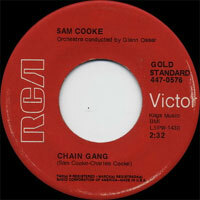 Cooke's own records were a little tougher to appreciate, however. Listeners who heard those first two, rather poor RCA albums, Hits of the Fifties and Cooke's Tour, could only wonder what the big deal was about, and several of the albums that followed were uneven enough to give potential fans pause. Meanwhile, the contractual situation surrounding Cooke's recordings greatly complicated the reissue of his work -- Cooke's business manager, Allen Klein, exerted a good deal of control, especially over the songs cut during that last year of the singer's life. By the 1970s, there were some fairly poor, mostly budget-priced compilations available, consisting of the hits up through early 1963, and for a time there was even a television compilation out there, but that was it. The movie National Lampoon's Animal House made use of a pair of Cooke songs, "(What A) Wonderful World" and "Twistin' the Night Away," which greatly raised his profile among college students and younger baby-boomers, and Southside Johnny & the Asbury Jukes made almost a mini-career out of reviving Cooke's songs (most notably "Having a Party," and even part of "A Change Is Gonna Come") in concert. In 1986, The Man and His Music went some way to correcting the absence of all but the early hits in a career-spanning compilation, but since the mid-'90s, Cooke's final year's worth of releases have been separated from the earlier RCA and Keen material, and is in the hands of Klein's ABKCO label. Finally, in the late '90s and beyond, RCA, ABKCO, and even Specialty (which still owns Cooke's gospel sides with the Soul Stirrers) each issued comprehensive collections of their portions of Cooke's catalog. CD 1 : All Of My Life / Bells Of St. Mary's / Canadian Sunset / Desire Me / Jesus Paid The Debt / I'll Come Running Back To You / It's The Talk Of The Town / Jesus, I'll Never Forget / The Lonesome Road / Love You Most Of All / Moonlight In Vermont / So Long / Stealing Kisses / Tammy / That Lucky Old Sun / When I Fall In Love / Win Your Love For Me / You Send Me / You Were Made For Me / Ain't Misbehavin' / Any Day Now / Come And Go To That Land / End Of My Journey / Around The World (In Eighty Days) / Must Jesus Bear The Cross Alone?